﻿ A Big Gulp; Anemones eating very large prey. 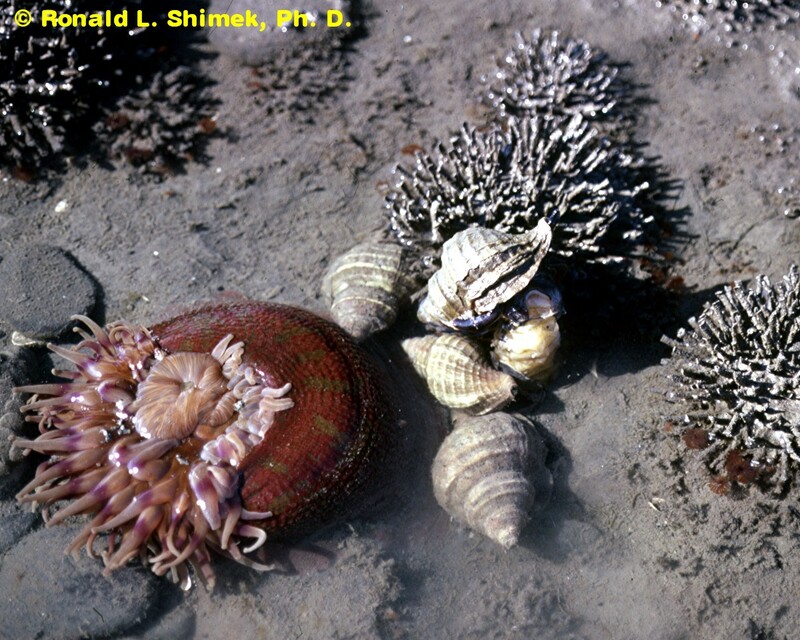 An intertidal Urticina grebelnyi with large whelks, Neptunea pribiloffensis laying eggs next to it. What marine animals eat in their natural environment has always interested me. As an aquarist, and as a zoologist, I know that finding the proper food and feeding it in proper amounts is probably the most important factor in animal husbandry. In the natural environment, if an animal doesn’t get enough nutrition, all else is moot, as the animal will die. Sea anemones are one of my favorite groups of animals, as they are for many other folks, but determining what they eat is no easy task. Generally, it is necessary to probe inside the animal to find out what it has eaten. And this can be quite dangerous. Back in my younger, and stupider, days I needed to determine what the beautiful Urticina grebelnyi was eating in one of my study sites. Over the course of two field trips, I examined the gut contents the easy way, I reached into the anemones’ gut cavity and pulled out the gut contents—with no gloves, as I needed feel for and find small foods. Yes, I knew they were venomous, but I was young, and thought there would be no damage. And after trying it a couple of times, I found it didn’t hurt, and the only evidence of the nematocysts was that everything on the inside of the critter stuck to my hand. I checked out about 100 anemones over a month or so. 2) It appears I am sensitive to most if not all species. Fortunately, I have not become fully sensitized, and have avoided anaphylactic shock. However, I am very careful around my aquarium, lest I forget to wear gloves. 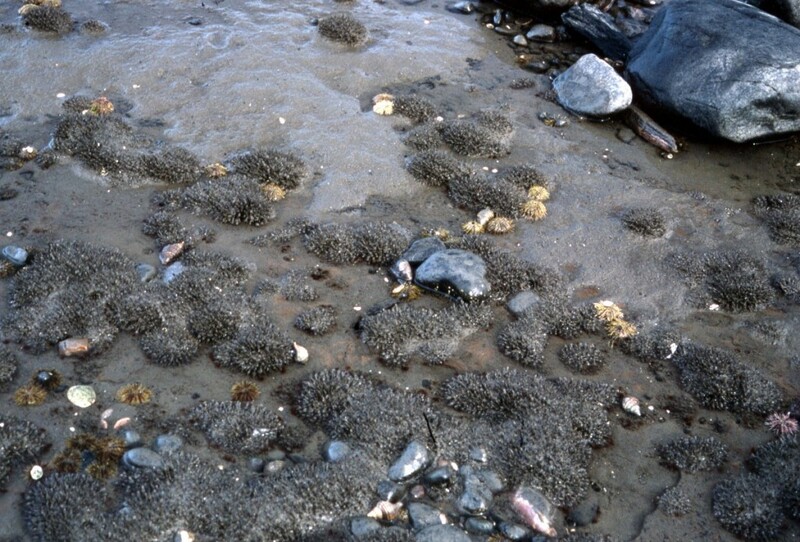 The intertidal habitat showing several whelks and numerous sea urchins. Anemones may use their nematocysts to kill their prey, provided they are eating live food. However some anemones use their powerful stinging capsular harpoons to become efficient scavengers, and the best recent example I have seen is a blog detailing an example of a large green anemone from the Pacific coast, shown here eating the carcass of what is identified as a common Murre chick, much larger than itself. These anemones often live in surge channels where they must hang on to their “catch” in high currents and turbulent flows. I suspect they have become adapted to that mode of life by having evolved particularly venomous and particularly adhesive tentacles, and that is well shown in the video. And probably would like it. If it had the mind to appreciate it. At the Feiro Center I regularly allow various anemones to sting me as a way to demonstrate how the animals catch their food why our visitors should avoid touching them. Based on your information from earlier articles I do try to minimize these demonstrations since I really dislike the idea of needing to wear gloves. So far the only problem has come from a brooding anemone (Epiactis fernaldi) that I touched by mistake while feeding – OUCH! As you know Epiactis spp. tend to be fairly small and sort of innocuous looking; what may be less obvious is that E. fernaldi at least is EXTREMELY aggressive when contacted by just about anything. I think the problem arose from a combination of the animal’s aggressive response and my stupidly allowing it to nail me on top of an unrelated injury. E. fernaldi was originally described from specimens found in a surge channel – I wonder if the aggressive capture response is an adaptation to living in a high energy environment? As always, a fascinating article. Thanks for posting it!